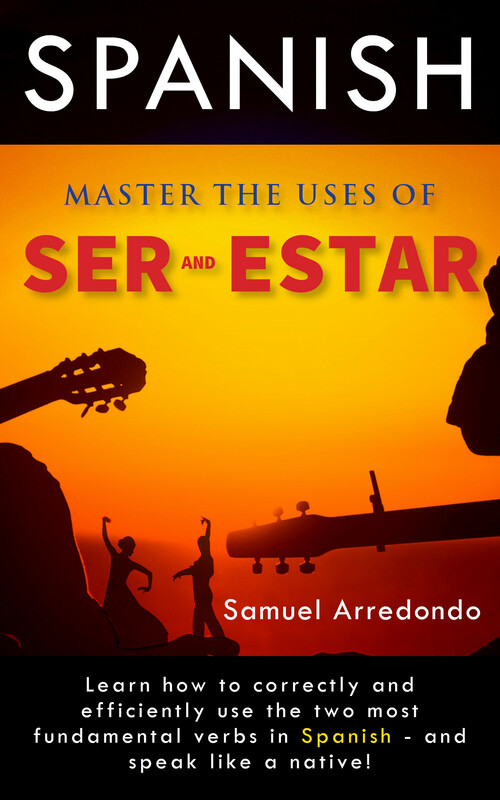 “Ser & Estar” Book Release…Finally! My book, the one I keep talking about saying “It’s almost here”… has been released in the Kindle eBook Edition on Amazon.com. You can check it out right here! The paperback will be out in about a week. The Kindle eBook is only $2.99, less than the cost of a Frappuccino at Starbucks [insert shameless marketing strategy here]. Side Note: When you purchase the hard copy, you get the Kindle eBook FREE, which means you can buy the hard copy and still have your Frappuccino! Categories: Book Review, Spanish, Tips, tricks and techniques | Tags: ser and estar | Permalink. Estar is used with a great myriad of expressions in Spanish and using them in your speech will help you to sound more fluent. Estar por signifies being in the mood for something. Mi perra, Shawna, está por tomar café. Es muy rara. My dog, Shawna, is in the mood to drink coffee. She is very strange. Estar para signifies something that is about to happen soon/in the near future. El autobús está para salir. The bus is about to leave./The bus will leave soon. Side Note: Entire books have been written on Por and Para, and the best one I have found is the the very in-depth book written by Gordon and Cynthia Smith-Durán called Pocket Por and Para. Los socios están de acuerdo. The associates are in agreement. Jimena está conforme con el trato. Jimena is in agreement with the deal. Miguel, que estaba sentado en el asiento trasero, estaba en las nubes durante la clase. Miguel, who was sitting in the seat in the back, was daydreaming during the class. Estaba en camino al trabajo cuando vi la vaca en la calle. I was on the way to work when I saw the cow in the road. Los ancianos están sentados. Los jóvenes están de pie. The elderly folks are sitting down. The youngsters are standing. El cielo está despejado ahora. No quiero hablar con él porque siempre está de mal humor. I don’t want to speak to him because he is always in a bad mood. Ella le está exigiendo veinte dólares pero eso está de más. She is demanding twenty dollars, but that is too much. Elizabeth estaba tan fuera de sí que rompió todo lo que encontraba en su camino. Elizabeth was so beside herself that she broke everything that was in her way. Los melocotones que compraron están de sobra. The peaches they bought are in excess. Agustín está loco de remate. El restaurante finalmente está en condiciones para recibir muchos clientes. The restaurant is finally in shape to receive many customers. Camila es muy bella y está en forma. Camila is very beautiful and she is in good shape. David está pez en Biología. David knows nothing about Biology. No podemos ir a comer porque estamos sin blanca. We can’t go eat because we are flat broke. Leonardo llegó tarde y por eso está en la luna. Leonardo came late and that is why he has his head is in the clouds. El doctor estará de vuelta en una hora. Salió a comer. The doctor will be back in one hour. He went to lunch. Hiciste tanto ejercicio y ahora estás hecho polvo. Descansa ya. You did so much exercise and now you are worn out. Just rest. El jefe se fue y estaba hecho una fiera. The boss left and he was furious. Que Susana se entere la verdad está en un tris. Susana finding out the truth is about to happen. Después de la lluvia los cachorros quedaron hechos una sopa. After the rain the puppies were soaked. Los estudiantes necesitan estar al corriente de las noticias de su país. The students need to be up to date with their country’s news. Mis tíos están a dos velas después de haber perdido sus trabajos. My aunt and uncle are broke after having lost their jobs. Mi amiga que nos visitó hace dos meses se sintió aquí como pez en el agua. My friend that visited us two months ago felt right at home here. No se moleste, solamente estoy de paso. Don’t bother, I am just passing through. My book, Ripping Apart the Spanish Language: Ser & Estar, is coming soon! Categories: Spanish, Tips, tricks and techniques | Tags: estar, ser and estar, Spanish, Spanish Expressions | Permalink. Millions of people have read my review on Gordon and Cynthia Smith-Durán’s “Demystifying the Spanish Subjunctive”. Okay, it’s a lot less than that, but I loved that book so much that I just had to buy this one– “Pocket Por and Para”, which was released in December, 2015. I purchase my copy from Amazon.com in Kindle format for $9.99 USD. The book covers exactly what you’d think it covers by reading the title– Por and Para in depth. If you are a student of Spanish, you have experienced having to figure out when to use either Por or Para to say “for, to, around, by” etc. This is the book you need. I began studying this book systematically on January 25, 2016, shortly after finishing “Demystifying…”. I continued my disciplined Spanish study routine of at least an hour every morning until I finished the book, going through it’s explanations and exercises. I completed the book on February 15. I was impressed! Gordon and Cynthia have done an excellent job putting this book together. The book consists of 177 pages of clear and simple explanation of these two Spanish prepositions. They take you on the road to an enlightened understanding of Por & Para and by the time you finish the book, you will be well-versed in the subject! As a language learner, I have used so many different grammar books. There are good ones. There are not-so-good ones. This one is great– one that uses a systematic non-boring approach to language study. The book contains 40+ sections, including an explanation of the authors’ system, a sort of a placement test, and an account of how Gordon got started speaking Spanish. The authors explain the many uses of Por & Para, such as deadlines, destinations, the meanings of “working for”, comparisons, Por’s use in the mathematical context, exchanges, asking for things, usages in the context of time– and a lot more. This book explains so much on the subject that if you study this book diligently, you will surely be fluent in Por & Para by the end. One thing that I look for in a language book is how well it expounds on it’s subject and how it goes about doing it. The layout is systematic. The explanations are well thought out. There are lots of practice questions– but they come in bite-size chunks, which will keep you from getting bored or feeling overwhelmed. Instead of just simple explanations and very short examples, this book makes you think about these words in way that just makes them stick in your brain. You get boat-loads of really good example sentences and, again, lots of practice sentences. I like how the authors have the “short” answers in the back of the book as well as the “full-sentence” answers. Gordan and Cynthia also use mnemonic devices in this book to help you remember better. (Mnemonic devices are techniques we can use to help us improve our ability to remember something.) For example, in the section “This for That exchange”, they use the word XCHANGE to help you remember that when you are wanting to talk about making an “xchange” you will use “por”. Por is also used for multiplication, or “X”. The book explains it very well in this section. In conclusion, I highly recommend this book if you are serious about wanting to speak fluent Spanish. Por and para can be tricky, and if you don’t want to be have to stop and think about which one to use when your using the language – buy this book. You won’t regret it! Check out my book review for Demystifying the Spanish Subjunctive here. I’ll be writing book review in the future on the Duráns’ other book, “Perfecting the Past in Spanish“. Categories: Book Review, Spanish | Tags: Book Review, LightSpeed Spanish, Por and Para | Permalink. For anything that is permanent, use Ser. For anything that is temporary, use Estar. El hombre está muerto. (The man is dead.) Is he dead only temporarily? My prima es soltera. (My cousin is single.) Will she be permanently single forever and ever? This rule is taught in our schools. It’s taught on the Internet. It’s in Spanish grammar books that I have on my book shelf while I’m writing this. Now it doesn’t have to mean that we can’t buy these books. There is certainly some very helpful information in them. They just are not telling us the whole story about the usages of Ser and Estar. And that’s where I come in. I want you to know the whole story about Ser and Estar. DOCTOR and PLACE are just not good enough. The uses of Ser and Estar can be memorized using the acronym “DOCTOR” and “PLACE”. And that’s one of the reasons I’m working on the book “Ripping Apart the Spanish Language: Ser & Estar“. Categories: Spanish, Tips, tricks and techniques | Tags: ser and estar, Spanish | Permalink. First of all, Happy Independence Day to all (in the US, at least)! I wrote this review back in January, but wanted to share it again, because this book is a must have for serious language learners and is one of favorites. It took me approximately a month and a half to complete this book from front to back. I began studying “Demystifying the Spanish Subjunctive”, by Gordon and Cynthia Smith-Duran on November 1, 2015 and did the very last set of exercises on December 16, 2015. I wasn’t slow. I wasn’t fast. I simply had a routine and stuck to it, never missing a day. If you’re interested in this post, you have probably heard of Olly Richards, a polyglot who lives in London and is very active in the polyglot community. “Teachers teach. Taxi drivers drive. Pilots fly. Language learners… well, they learn languages. Not once a week – but at every opportunity. You can find him at “I Will Teach You a Language”. This is now officially my new favorite (language learning) book, and I’ll tell you why. It makes learning the subjunctive easy and clear with lots of explanations and translation practice. The book starts out easy and gradually gets tougher as you go. This book will make your other Spanish grammar books stay on the shelf. What has really appealed to me is that the authors seem to genuinely want to help others to learn Spanish better, and that means a lot to me personally. They obviously love what they do. Just so it’s clear, I’m still studying the Spanish subjunctive. The learning process will never end. And that’s okay with me, because the way I see it, I can only get better and better with each step. After taking a couple of those online Spanish proficiency tests, I noticed a couple of things about myself. I learned that my Spanish isn’t too bad (I scored pretty high). I also learned that while I had believed that I did well with the subjunctive I had come to realize that, and please excuse my language, I sucked at the Spanish subjunctive. The few questions that I got wrong on these tests all dealt with this area. As a serious language learner, when I identify an area of the language in which I am lacking, it becomes my new target. I aim at it, tackle it, and conquer it. But how could I get better at the subjunctive? I went to my book shelf, where I have many books on Italian, Korean and Spanish. I pulled my old “The Ultimate Spanish Review” book from the shelf. It had few pages explaining the subjunctive, but there is no way I would become proficient by going through a few brief explanations and some fill-in-the-blank exercises. I was dissatisfied with the brevity of the subject. This just wouldn’t cut it. I got on YouTube and did some searching. I saw that LightSpeed Spanish had some videos on the subjunctive. I had already seen quite of few of Gordon and Cynthia’s videos on other Spanish learning subjects and found them very helpful. I watched a couple of their videos on the subjunctive and found them to be really clear and detailed. I found the book on Barnes and Noble and purchased it for my Nook. It’s on Amazon as well for the Kindle, but I knew that I would most likely be jumping around the book checking answers and reviewing exercises and explanations. The Nook app is better, in my opinion, at handling bookmarks. By 0515, I am sitting down with my cup of coffee at hand’s reach and I do at least 30 minutes to 1 hour of intensive study, which includes reading, writing, and looking up words in my Oxford Spanish dictionary. By 0630 (-ish) I am off to work. While in my Jeep, I use my 25 minutes of drive to do my Gossika Spanish, in which I listen and repeat. On the way home from work, I do more Glossika. Before going to bed, I read. I read the news in Spanish (like El Pais), or Olly Richards’ Spanish Short Stories, the Bible in Spanish, etc. In addition, throughout the day I’ll do a little chatting in Spanish on the HelloTalk app (you can read my review on this blog as well). I changed my Android phone (HTC One M8) to Spanish. I make my grocery lists and other to-do lists in Spanish. I watch videos in Spanish. If I have seen a certain movie in English, I’ll search to see if there’s a Spanish version. The ones that are more helpful, though, are the movies that are made in Spanish. And other stuff I can’t think of…. all this will help you to learn how to “think in Spanish, too, by the way. On page 44 of the book, the authors write, “The subjunctive is not just about casting doubt on things. It’s so much more than that!” I couldn’t agree more. By going through this book and the many exercises it contains, I’ve not only improved my knowledge and use of the subjunctive, but have refreshed my vocabulary and even learned some new words, expressions and sentence structures. The subjunctive is broken down and dissected in this book. I don’t see a small 3 page section of the subjunctive in a grammar review book, but rather an entire book of almost 200 pages on the subject! The book starts off with a very interesting introduction by the authors on “subjunctivitus” and Gordon’s “light bulb moment”. It goes on to review the subjunctive structure – verb conjugation to form the subjunctive, then jumps right in. There are lots and lots of good exercises on the different kinds of subjunctive triggers. Instead of fill-in-the blank, I like that the authors present the sentences in English, which we translate into Spanish and write them down. This is excellent for language learning. Translating and writing them down somehow tends to make them “stick” in our brains. The final review towards the end of the book is about 10 pages long and covers all the different triggers that are mentioned in the text once again. In case you need it, there is also an index of verb conjugations in the back of the book. If I had three thumbs, I’d give this book three thumbs up. Have you ever wasted money on a book before? Not gonna happen if you purchase this one. You’ll love it. I highly recommend it to anyone who is serious about learning or reviewing Spanish. I will definitely check out Gordon and Cynthia’s other books! Categories: Spanish | Tags: LightSpeed Spanish, review, Spanish, subjunctive | Permalink. Language study as we all know is time consuming. But I love studying languages. In between writing and illustrating for my book, Ripping Apart the Spanish Language: Ser & Estar, I still conduct my morning Korean Study. Lately I am studying the several different “markers” that exist in Korean. Here’s an example of my notes. For me, and for a lot of language learners, writing it down a few times really helps it “stick” in my brain. Categories: korean, Spanish | Tags: Korean markers, ser and estar | Permalink.